For over 18 years we have specialized in Integrative & Laser Medicine. Our expertise includes a broad spectrum of treatments for cystic acne and skin. From conducting our own independent research to utilizing well established conventional acne therapies. We have explored the use of virtually every applicable technology, from the most expensive and sophisticated medical lasers, to the simplest and most “natural” remedies for acne, with which we have administered over 65 thousand treatments. We are particular focused on using “evidenced based science” to develop acne protocols that achieve the best possible clinical results. What we have found is that the best possible results to get rid of acne are often achieved by combining different treatment modalities. This “Multiple Modality” approach has been particularly rewarded by the recent advancement in laser sciences and the many different types of medical lasers now available that we can use in combination protocols for acne. Far and away the most effective acne treatment that we have found for common and light to moderate cystic acne are treatments that utilize lasers and Photodynamic Therapy. In fact, we have tracked cystic acne patients who underwent our protocols for over nine years without recurrence. In addition to the remarkable efficacy of laser protocols, lasers offer the added benefit of being completely natural therapies with absolutely no side effects. Lasers emit pure energy in the form of a single specific frequency of light. Their effect extends only to the local tissue in the targeted area. Thus, unlike drugs, lasers have no systemic negative side-effects that involve other organs systems. Additionally, as lasers are able to work on, in, and under the skin without cutting the skin and exposing a vulnerable wound, laser acne treatments are non-invasive. ARE ACNE TREATMENTS THAT UTILIZE LASERS SAFE? Many acne patients ask about the energy that lasers emit, and whether or not there are hidden dangers in being exposed to it. Lasers have been used in medicine for over 50 years. They are powerful, and unskilled use can definitely damage you. Thus, expertise in their use should always be employed. However, other than the direct, instantaneous and local effects of the energy on the targeted tissue, no side effects on human physiology have ever been reported. A laser will affect only the targeted tissue exactly at the moment of treatment, nothing more, nothing less. Also the frequencies of energy used are nowhere near the very short waves of “radiation” energy that are used in X-rays and nuclear medicine. 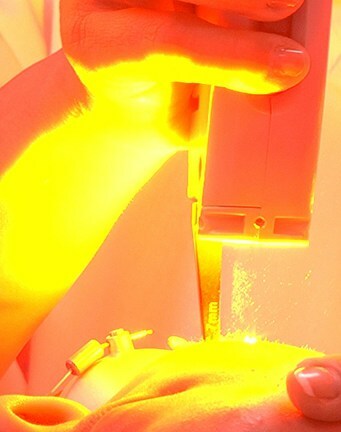 Therefore, as long as the laser is being skillfully used, they are completely safe, and do not cause side effects. As mentioned earlier, lasers emit a single frequency of energy. Because of that, lasers are very “target specific”. A particular frequency of energy might be easily absorbed by blood, but not be absorbed at all by collagen, fingernails or warts. Therefore, to target different components in your skin, it is best to have a collection of different lasers that each target specific and distinct tissue. Once the best match has been found between a particular tissue or cell type and the specific frequency of energy that targets it best, the energy can then be manipulated or “modulated” in many ways to achieve the desired response from the tissue. Though years of research were required to discover the most effective protocol for acne, the treatments are actually quite simple. Depending on the severity of the acne, and the responsiveness of the patient’s physiology, a series of 3-5 acne treatments are typically needed, wherein three different types of lasers are used during each treatment. Laser #2: Targets inflammation. The body’s physiological response to acne includes an inflammatory immune reaction. 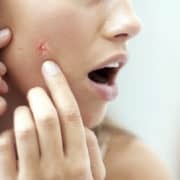 That is what makes pimples red and swollen. 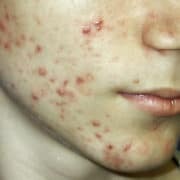 The inflammation is also the cause of much of the acne scarring that is associated with severe cystic acne. Shutting down the immune response will greatly accelerate the healing of the acne. Note: In the case where the inflammation is also in response to a bacterial infection of the skin, it is important to provide something to directly combat the bacteria such as oral antibiotics or antibacterial cream. Laser #3: Targets the Stratum Corneum of the epithelium. Precisely removing this uppermost dead layer of skin opens up the pores and allows your skin to “breath” and expel trapped sebum (oil). This is particularly important after Laser #1, because treated sebaceous glands will often purge their excess contents. Furthermore, when this procedure is done correctly, it will also stimulate the renewal of your entire epithelium. In approximately 3-5 days, a brand new army of epithelial cells will march to the surface and push off the old epithelium. You will undergo a dry flakey peel during these days, revealing a bright new and radiant epithelium underneath. Treatments with Laser #3, which we designate as an “epithelial peel and regeneration” are very popular among women who otherwise spend considerable time and money regularly exfoliating. Even without acne, many women book this treatment on a monthly basis. During the week following this procedure, the skin is particularly vulnerable to negative influences. It is important to protect the skin from direct sunlight. Additionally, to protect and nourish the skin after this procedure, special creams should be used. We are particularly dedicated to the use of natural substances that do not introduce any artificial substances to the skin during this vulnerable week. Using a moisture barrier is particularly important during the week following the procedure, to protect the skin from drying out. When patients with severe cystic acne come to us as candidates for Photodynamic Therapy, it’s because they are at the end of their rope. Typically, they have tried everything else already, sometimes more than once, and nothing has worked. 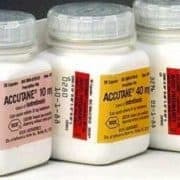 Some have even tried Accutane, and some, unbelievably, even took on the Accutane risk more than once. Others are desperately trying to avoid Accutane and are searching for one more option before they truly have no other last resort. 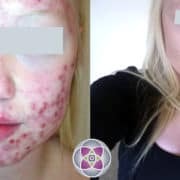 For these patients, we have found that PDT, when combined with other specific therapies in a customized protocol will truly heal their terrible cystic acne 95% of the time. Photodynamic therapy is based on a natural biochemical reaction that is already taking place within sebaceous glands. PDT amplifies this biochemical reaction to the point where it shuts down the hyperactivity and overgrowth (hypertrophy) of problem sebaceous glands. At the heart of this biochemistry is a Porphyrin molecule. Porphyrins are a class of molecules that are prevalent in human physiology, most notably as part of the hemoglobin complex of molecules. 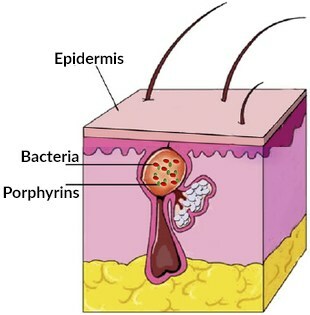 Porphyrins also happen to be produced most everywhere fast replicating cells happen to be… such as in overactive sebaceous glands. Another remarkable characteristic of many Porphyrins is their innate capacity to absorb specific frequencies of light. (In plant life, porphyrins are present as part of the chlorophyll complex of molecules that are essential in absorbing solar energy (sunlight) and converting it into chemical energy.) When porphyrins present in sebaceous glands are thus activated by specific frequencies of light, they release a “singlet oxygen” atom, which is very toxic to other living cells, and quickly kills them. A “singlet oxygen” is a lone oxygen atom with a single free electron. It is not bound to any other atom, not even another oxygen, as in the oxygen molecules we breathe; O2. When singlet oxygen atoms are released within a hyperactive and overgrown sebaceous gland, they quickly kill the overactive sebaceous cells, reducing the gland’s hyperactivity and over-growth, forcing the gland back into proper physiological function. 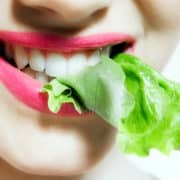 However, there is not a high enough concentration of naturally occurring porphyrins in hyperactive sebaceous glands to produce a reaction intense enough to shut down the gland. Thus a patient must first be treated with Aminolevulinic Acid (ALA) which increases the amount of porphyrins being produced in the sebaceous gland. Note: For those who are wondering about singlet oxygen atoms damaging other surrounding tissue, that’s a good question. Fortunately, once a singlet oxygen atom has attacked a nearby cell, it itself is deactivated by that interaction, and thus can only attack once. It is essentially a “one shot bullet”. Furthermore, the reaction takes only a second to run it course. Therefore, only cells in the immediate area where singlet oxygen atoms are released, inside our problem sebaceous glands, will be subject to their toxic power. Here is the sequence of events that constitute a complete PDT acne treatment as performed in our clinics as a multiple modality protocol. 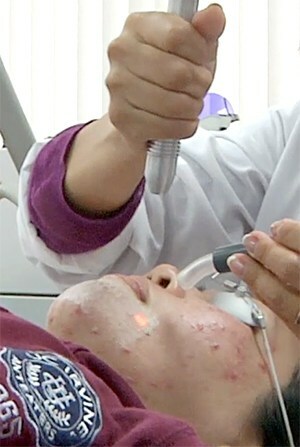 The patient’s skin undergoes a laser epithelial peel. This procedure precisely removes the dead layer of epithelium that otherwise acts as a barrier, blocking the skin’s capacity to absorb anything. The deeper the peel, the more ALA will be absorbed creating a progressively more intense treatment. Considerable skill of assessment and skill with lasers is required by the attending physician to determine and execute the appropriate extent of the peel. Aminolevulinic Acid (ALA) is spread over the skin. ALA is a very mild acid that is naturally produced in our physiology. The patient will “incubate” with ALA on their skin for 30 – 90 minutes depending on how intense the procedure needs to be. The longer the ALA remains on the skin, the more porphyrins will be created in the sebaceous cyst, leading to a more dramatic acne treatment. The ALA is washed off the skin, and the patient undergoes the first step of photo activation. This is accomplished with the use of specific lasers that emit a frequency of energy that is target-specific for absorption by porphyrin molecules. This step can be particularly effective on individual cysts, especially large ones that need to be individually targeted and strongly dosed with activating light. Once again, the expertise of the attending physician is critical in determining how much energy needs to be delivered to each individual sebaceous cyst. The second phase of photo activation entails exposing the entire area being treated with a specific frequency of blue light in order to further treat all the sebaceous glands in the entire area that is affected by cystic acne. Singlet oxygen atoms are released within sebaceous glands throughout the area, shutting down hyperactive and overgrown cysts. The exposure time varies from 15-60 minutes. Again, considerable expertise is needed to determine the optimal time. Though the treatment itself is not at all difficult or painful, the following 7-10 days can be a very distressing experience. When done correctly, the patient is likely to look much worse before they look better. Treated sebaceous cysts may purge all at once, causing a dramatic and intensely ugly breakout. Furthermore, the patient should expect to experience an intense epithelial peel wherever the PDT was applied. This peel is dramatic, and if not prepared for how bad it may appear, it can be seriously scary to look at. As a matter of fact, it is not dangerous, and though it may look like the patient’s face has been burned by some sort of horrible acid, the treatment is actually proceeding precisely as it should. The ugly PDT treated peeling skin falls off, revealing beautiful new skin underneath. Patients typically do not experience significant pain or discomfort, and report the sensation as similar to a bad sunburn. As a rule; the more dramatic and scary the peel the better the result. At our clinics, we are very intentional about showing every PDT patient how scary the recovery may look, so that we don’t get frantic midnight calls from the patient wondering if they should go the Emergency Room. Bottom line, patients should be thoroughly educated with “before & after” photos of other PDT patients so that they are prepared for the peel and recovery. Additionally, though patients are fully functional during recovery, it is unlikely that anyone going through this wants to go out in public for 7-10 days… unless of course you are staring in a horror film, or your treatment happens to conveniently coincide with Halloween! Photodynamic Therapy performs its magic on severe sebaceous cysts in just a few minutes while singlet oxygen atoms are released within the glands. Thus, in a few hours PDT is complete, and the rest of the dramatic story is all about how your skin recovers. The following elements can greatly enhance the recovery process and ensure the best possible results. Antibiotics: As you can imagine, a dramatic purging of sebaceous glands in addition to a full epithelial peel, might present a fabulous opportunity for bacteria to settle in. Thus, as a precautionary measure, antibiotics are frequently prescribed for the course of the recovery. Hyperbaric Oxygen Therapy (HBOT): During HBOT treatments, a patient’s body is thoroughly saturated with oxygen, down to the level of individual cells in every organ of their body. This level of oxygen saturation is not possible to achieve except through HBOT. 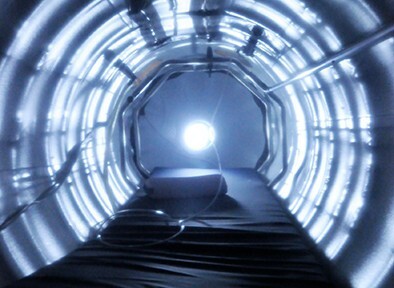 Accordingly, HBOT treatments are uniquely healing of many serious and debilitating conditions, and can reduce recovery time from many medical procedures including surgeries and PDT. A daily regimen of HBOT treatments will significantly accelerate the speed of recovery from PDT, and contribute to the best possible results during the regeneration of healthy new skin. Ozone: Ozone is one of the most powerful stimulants of physiological healing and regeneration in the natural world. In addition to its spectacular antiseptic properties, treatments using ozone can bring about stunning healing of disease states, as well as the regeneration of healthy functioning tissue. Infused within natural oils, ozone is very effective as a topical lotion. Used appropriately during the recovery from PDT, ozone oils will protect the skin from infection; significantly shorten recovery time and enhance the regeneration of healthy skin. As described above, Photodynamic Therapy protocols combined with lasers are the single most effective acne treatment we have ever experienced for severe cystic acne. Depending on the severity of the case, 2-3 treatments might be necessary. Fortunately, as sebaceous cysts are progressively shut down, each treatment is progressively easier to go through. Fortunately, once successful PDT treatments have been completed, a relapse of cystic acne is very rare. In the final analysis, it is the best and safest option for treating severe cystic acne, and the results are truly fantastic, leaving the patient with clear and healthy skin. 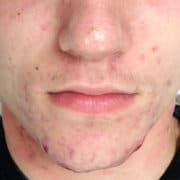 About Accutane: When objectively comparing the results of PDT to other acne treatments, a 4-6 month course of the drug Accutane is the only other treatment that can achieve dramatic clearing of sebaceous cysts. It is however, a very dangerous drug that has many terrible side effects occurring in a variety of other organ systems, some of which are debilitating and life-long. Though the original drug was revoked by the FDA, it is still available through generic manufacturers, but under very restricted conditions. Many physicians refuse to prescribe it.